So… How do I get to Montezuma? Coordinating travel isn’t always easy, but we know you’ve got things to do and planes to catch and a tight schedule for all of it. So we’ve collected a few bits of useful information regarding transportation into and out of the area to shave a few minutes off your online research and planning time. 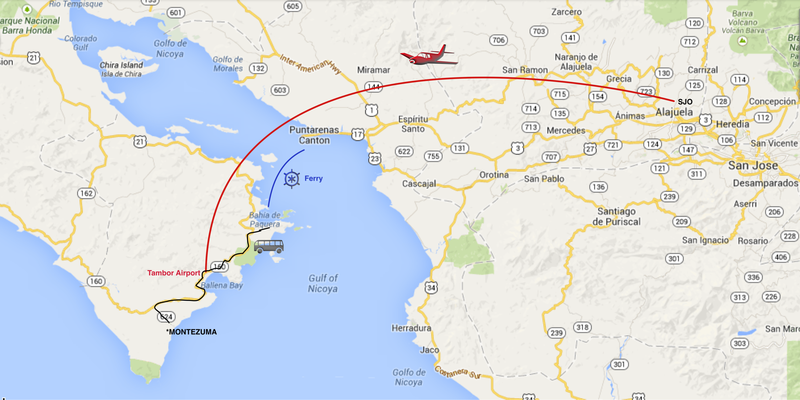 Nature Air now has direct flights to and from San Jose Juan Santamaria International Airport to Tambor Airport. Tambor is just 45 min. north of Montezuma, an easy bus, taxi or shuttle ride from there can get you to your hotel. Keep in mind, these are small planes, so book early to ensure a cheaper price and secure a seat before they’re all taken. Also, make sure your domestic flight leaves you plenty of time to go through security and check in for your international flight on the way out. There are plenty of shuttle services to get you to Montezuma from key connection points. Shuttles will cost a little more but can get you here faster, in more comfortable style and drop you off directly at your hotel. Most have baggage restrictions and will charge an extra fee for surfboards so specify any special needs when making reservations. Larger, more reputable shuttle services are easily booked online, others are best arranged by phone or by your hotel. Public buses are a cheaper option, don’t require reservations, and connect with ferry schedules but can sometimes be crowded and take much longer to get you to your destination. Schedules tend to change unannounced and vary substantially, so if you’ve got some place to be at a specific time, better opt for a shuttle or a taxi. Also, to take the bus from the ferry in Paquera to Montezuma, you’ll need to be on the 5pm ferry coming over as that’s the last connecting bus of the day. Loose bus schedules for the area are posted here, or can be found in the printed version of Zoom magazine available at most hotels. Asking a local is usually your best bet for confirming the actual time of the next bus. The Naviera Tambor connects the pacific coast of Costa Rica to the Nicoya Peninsula via Puntarenas and Paquera (the peninsula side) transporting both passengers and vehicles. The schedule and ticket fares can be found here. Tickets can be purchased at the dock the day of departure, but be sure to check schedules a couple days in advance of your travels as times do change occasionally for maintenance purposes. For an added bonus, take the 5pm ferry and get some great photos of the sunset as you cruise along. This entry was posted in Costa Rica, Travel and tagged costa rica, ferry schedules nicoya peninsula, flights to nicoya peninsula, Montezuma, montezuma buses, Montezuma Costa Rica, montezuma shuttles, Nature Air, Nicoya Peninsula, Puntarenas, Tambor Airport, transportation to montezuma, travel to montezuma. Bookmark the permalink.